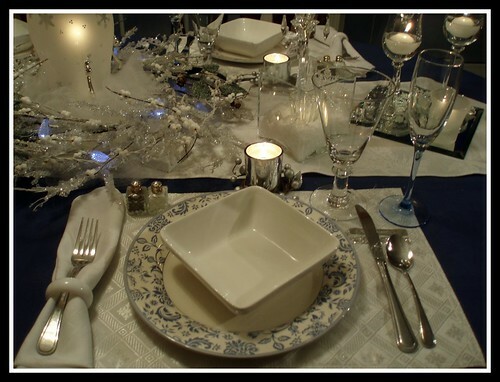 I am doing a repeat of a winter tablescape I posted when I first started my blog. It only had one comment then so I'm pretty sure it will seem new to most of you. This tablescape started with some lovely blue and white plates I received as a Christmas gift last year from my dear daughter. I love the delicate pattern on the border. For a centerpiece, I used a Snowflake Hurricane Shade by Partylite surrounded by an icy wreath and blue/white battery operated LED lights. 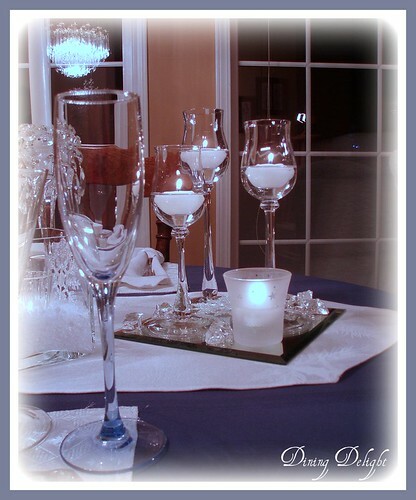 On each end of the table, I placed a trio of candle holders, also by Partylite, with floating candles inside. A mirror coaster and acrylic ice chips add to the frosty look. 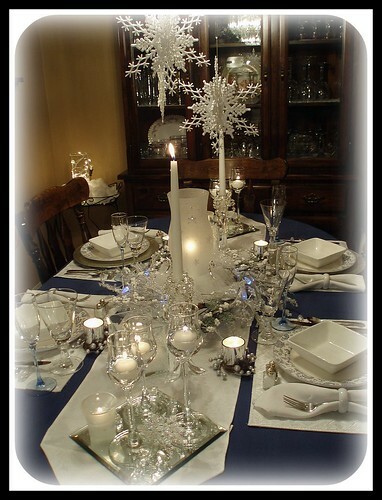 Square vases filled with faux snow and a votive holder flank each side of the centerpiece. Each place setting has individual silver coloured votive holders surrounded by faux silver berries. While I love the frosty look of this winter tablescape, I think I'm ready for some colour and am looking forward to the upcoming Valentine's Day and St. Patrick's Day tablescapes. Did you notice my "blooper"? I had taken away a silver charger to use elsewhere and forgot to put it back before taking pictures! Oops! ...Now pour yourself a nice hot cup of tea and relax while you take a virtual trip around Blogland accepting all of the invitations into dining rooms, kitchens and cozy nooks to see a miriad of tablescapes! Oh sooo icy and cold. A perfect winter tablescape! This is soooo beautiful! I love the centerpiece and everything else you have done here! Very winter-y and very beautiful! Your TS is wonderful. I love those plates. Now what time should I be there? That looks beautiful, DD, and I know how you love enjoying your long winters. The plates are so pretty! Blue and white is one of my faves..and when Spring arrives, so many scapes you can do with them for that season too! A very pretty table but I do love anything blue and white! It does look like winter! I'm glad you reposted this...it is gorgeous. I love the way the blue lights look with everything else. Wow...stunning. Very pretty. I love sparkly tablescapes, don't you? Can't wait to see more! Absolutely gorgeous! So perfectly done -as are all your tables! Can't wait 'til the next one! So pretty! 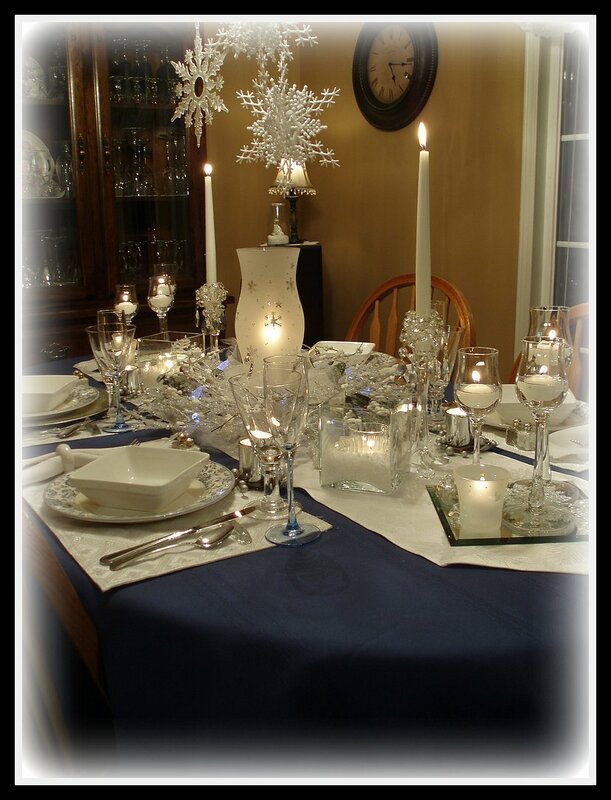 !~ I love all the sparkle and the snowflake candle centerpiece is so pretty!! 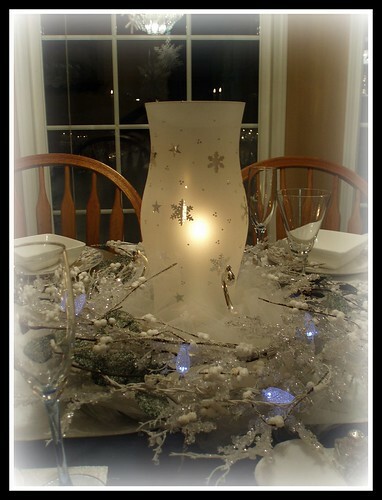 I love the icy look...really pretty centerpiece. Thanks for sharing. Love this wintry theme. The blue and white and the icy feeling are just lovely. Very pretty winter tablescape! Love the snowflakes! No, I didn't notice the blooper! 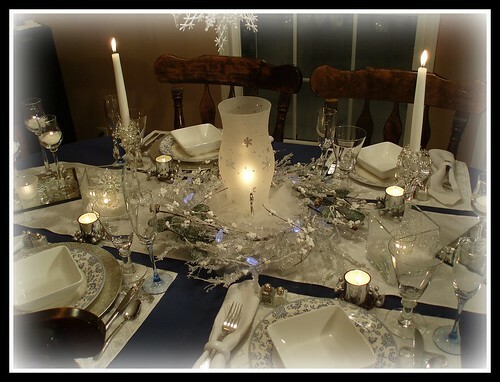 What a wonderful "winter-land" tablescape! What is the name of the china? I really love it. love,love,love tis table...thanks for sharing. That is absolutely beautiful. You have such gorgeous tablescapes -- I've never really seen anything quite like it. Do you also cook? Do you cook a lot? I have never set up such a beautiful table.! I could learn a lot from you. Very beautiful and perfect. A unique tablescape, for sure. Thanks for sharing and for stopping by. that is abeautiful table setting, the colors work great with each other, glad you reposted! What a pretty winter wonderland you've created on your table. It truly sparkles! Such an elegant look. Truly lovely! Such a gorgeous tablescape! I love the blue and white together and all the pretty touches, such as the hurricane and wreath centerpiece. Fantastic! Love the wintry theme!! Beautiful!! Beautiful winter tablescape! It all glistens and shimmers just like new fallen snow. I'd love to be a guest at this table! I'm so glad you reposted this post of your pretty table! It's gorgeous! 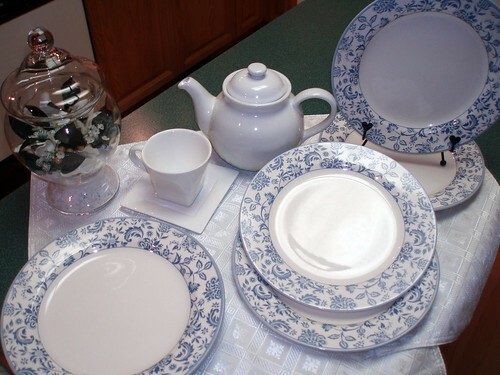 I love the blue and white china and those square bowls are lovely! The centerpiece is amazing. You've not left out anything - everything is so pretty! Very elegant!! The centerpiece is beautiful. It's still winter in Wisconsin, so this table would be perfect! A great look for New Year's Eve midnight dinner too! Lovely setting for winter. Blue and white are one of my favorite combinations too. Thanks for sharing your beautiful table! I love your winter table setting. It's gorgeous. Love the icy look and feel. This is a theme that I want to try next year. Thanks for sharing. Your blue and white table looks very inviting and warm-not icy at all! I used square plates in my tablescape this week too-great minds! WOW!!!!!!!!! Just when I thought I was getting tired of winter, watching a new snowfall here in the mountains of the the northwest corner of North Carolina, I am enthralled by your winter wonderland!!!!!!!!!!! Lovely!!! I love your table. I will always love blue and white. It makes a great winter table. 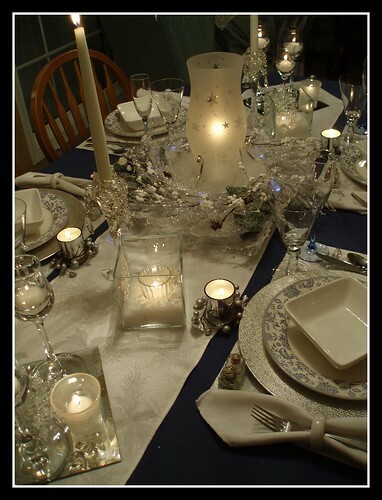 Such a pretty tablescape...I love the icy yet inviting feel of it. The hanging snowflakes are a nice touch. Wow! I just discovered your blog. What delightful ideas you have. I love how you created the icy winter look without using much color, yet still managed to make it appear warm and cozy. I am throwing my friends a party after Christmas, using my white snowflake hurricane as my centerpiece for the first time. Thanks for such inspiration. Love your dishes and center pieces. Mind sharing where you found the mirror coasters/centerpiece? Faux snow? I have some decorative snowflake ornaments that I've used for our Christmas tree for years. I wonder if I could use them like you have used them. How would I use them for hanging in living room window? Organdy ribbons, fishing line? How could I respray them and add glitter? This is just what I have been looking for, something that is winter themed, not Christmas. BEAUTIFUL! Absolutely elegant and inviting. I love the sparkle, elegance and beauty of this arrangement. I am going to use on tables next year for our Christmas party. Love what you did! My entire Christmas theme is Winter Elegance, so this is right up my alley!